NEET 2018 Application Form can be submitted till 12th March 2018 (Extended). It is the national level examination for admission to MBBS & BDS courses. CBSE is the conducting authority which organizes the NEET examination every year in various cities across the country. NEET exam is the only gateway for admissions into medical & dental UG courses offered by various government and private medical colleges of the country. All medical institutions consider NEET score for providing admission in MBBS/BDS courses. Through this article, students can get details about NEET 2018 exam including application form, eligibility, exam dates, exam pattern, syllabus, etc. As per the order of Hon. Supreme Court, Aadhaar Card is not mandatory to fill the NEET 2018 (and other national) application form. 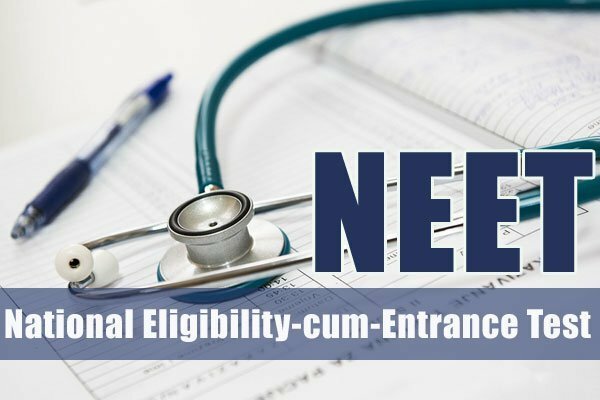 Now, NEET 2018 application form can be submitted till 12th March 2018(Extended). NEET 2018 Application Correction (one time correction facility) will be started from 15th March 2018. NEET 2018 Notice for Open School candidates regarding form submission has been released now. Now the candidates those age is above 25 years (30 years for Reserved Quota) or those are Private/NIOS candidates or those are having biology as an additional subject, can fill the NEET 2018 application form before the last date (12th March). Appearance in NEET examination for such candidates will be decided by the High Court after next hearing (on 6th April). NEET 2018 Notice regarding mismatch in aadhaar card and class X & XII certificates has been released. NEET 2018 Additional FAQs based on calls, emails and grievances received have been released. NEET 2018 Notice regarding Eligibility Criteria for Open Schools/Private candidates has been released. No offline application is issued by the authority. Candidates can fill the application from 8th February to 12th March 2018 (Extended). Aadhaar Card is not compulsory to fill the application form. Upload the scanned images of photograph & signature in the prescribed format. Make the fee payment by using online mode. After the fee payment, take the three printout of the confirmation page of the application form and keep it safe for further use. The correction period will be opened from 15th March to 17th March 2018 (Revised). The fee payment can be made via online mode (debit/credit card or Net Banking/UPI or E-wallet). Candidates can submit online fees upto 13th March 2018 till 11.50 PM. Aadhaar Card Requirement: Now adhaar card is not mandatory to fill the NEET application form. Note: Final decision is Pending in court for the upper age limit. The syllabus is based on a common syllabus prescribed by the MCI (Medical Council of India). The syllabus have topics from Physics, Chemistry, Botany and Zoology subjects. 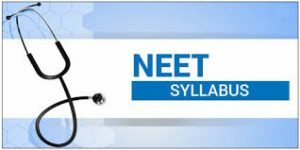 Download the NEET 2018 syllabus here. It has been prescribed after the review of various state syllabus as well as CBSE, NCERT & COBSE. The syllabus is based on the 11th & 12th class standard. Note: As per the official site, the Syllabus of NEET(UG), 2018 is exactly same as it was for NEET(UG), 2017. There is no change in the syllabus for NEET(UG), 2018. Successfully registered candidates will be able to download the NEET Admit Card. The admit card will be released in the second week of April 2018. The authority shall not provide the admit card by post. The NEET hall ticket will contain details like Candidate Name, Father Name, Category, Photograph, Roll Number, Exam Date & Timing, Exam centre, etc. Candidates are advised to preserve the admit card till the admission process gets over. The answer key will be released within a week of examination. NEET Answer Key will be published via online mode through the website. Candidates may have an opportunity for online challenge against the answer key. Candidates have to pay Rs. 1000/- per answer challenged. The payment will be refunded in case of challenge is accepted by the Board. The authority shall release the NEET Result via online mode through the website. It will be declared on 5th June 2018. Candidates can check their results by entering their roll number and other required details in the website. Students are advised to keep extra printouts of the result for further use. A merit list will be prepared for admission as per the guidelines from the Hon’ble Supreme Court of India, DGHS, MCI and DCI. Cut-off is the minimum marks candidates are needed to qualify the examination. It will be based on number of students appeared in the exam, difficulty level and availability of seats. It will be released in the month of June 2018. The minimum qualifying marks should be 50% for general, 45% for general-PH and 40% marks for reserved categories. Students will be able to participate in the counselling process according to their rank. Counselling for 15% All India Quota will be organized by MCC of Directorate General of Health Service (DGHS) through online mode. Counselling for other than 15% All India Quota will be managed by the respective authorities. The first round will be organized from 12th to 24th June 2018. During the counselling process, candidates have to pay the counselling fee and choose their preference for colleges. Seats will be allotted to candidates on the basis of filled choices, rank and availability of seats in colleges. After seat allotment, candidates will be needed to appear at the allotted college to complete admission formalities. If you have any other queries about NEET 2018, you may leave your queries in the comment section below.